When I first got the Color Club Beyond the Mistletoe collection, this is the first one I put on. Holiday Splendor. It's the only one in the collection that has a tinted base together with the holographic glitter. 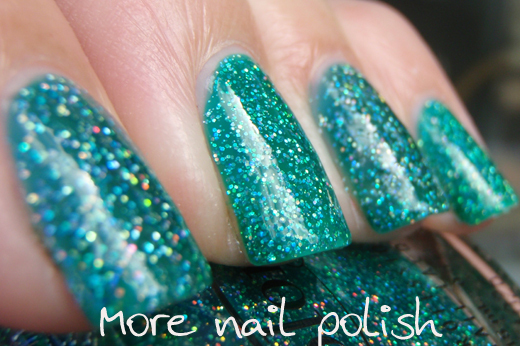 This is such a beautiful polish. Seriously. It is beautiful. 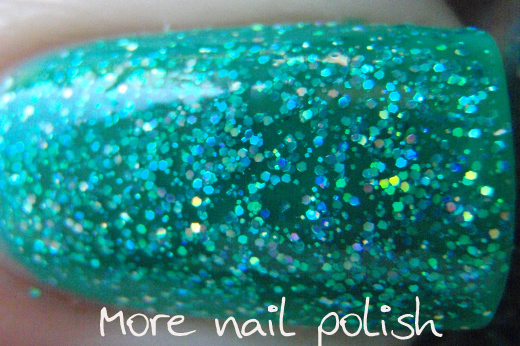 You are guaranteed to get comments on your nails when you wear this polish. This was two coats, over Nail Tek II foundation, then four layers of top coat. Color Club top coat that came with the set, Ulta3 non-chip, Gelous and Seche Vite. Once it had totally dried, it was still a bit textured and not 100% smooth. I think some of the other swatches I've seen of this must be taken when the top coat is still wet, to get that amazing glossy finish. Just be warned, these are gritty. Just like the Nubar Sparkles. It's hard to capture the holographic goodness of the glitter in photos. In the shade you don't see the multi-coloured sparkle, but then in the sun my camera spazzes out and doesn't show any sparkle either. Here it is in the sun. 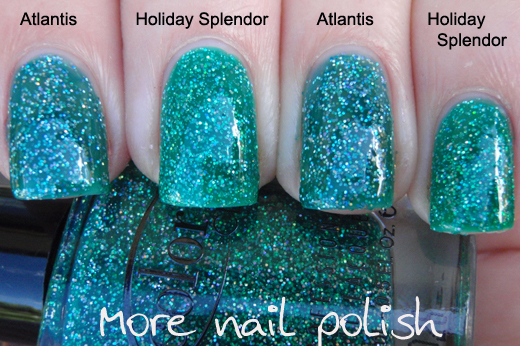 Holiday Splendor is very similar to China Glaze Atlantis. The only real difference is that the jelly base in Atlantis is slightly darker. The other thing I only noticed today is that Blogger has updated the comments section and it now allows individual replies to each comment. Have I been under a rock and not noticed this for weeks, or is it just really new? Either way, YAY, I've always wanted to reply to individual comments and had considered going to another comment plugin. So expect to receive replies for as long as I can keep up with them. You're most welcome. It was cheaper for me to get the whole collection, so I'm prepared to say they are different enough for my collection. Yay I love the personal replies! Gorgeous! I have it too and Sugar Plum Fairy which I've worn for the New Year's Eve. Thanks for the comparisons and for the tips! IKR - four coats should really be enough! 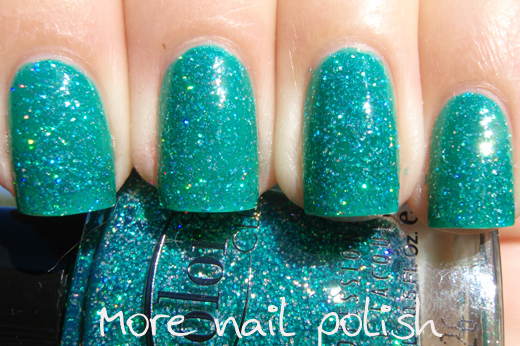 I think I need to get Glitter Tamer from Llarowe when she gets it back in stock. Wow, so beautiful! Love the color! Yes, amazing colour. A must have in my opinion! What a great polish. I have it in my untrieds - but since Atlantis is one of my favourite glitters, I am already looking forward to trying it on. FOUR layers of top coat, though?! O__o That's a lot! I totally love this individual replies thing. I feel like I'm actually chatting with each commenter! It must be really new if its not rolled out everywhere. 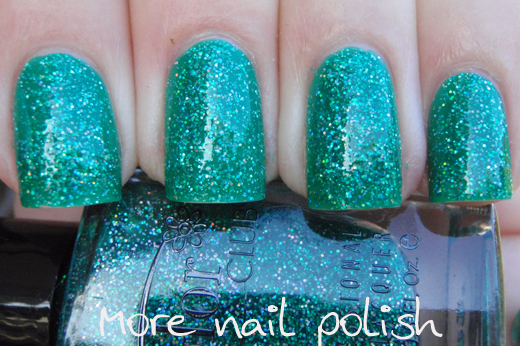 The green colour with the holo glitter is amazing. Oooh thanks for the comparison! I've had Atlantis on my wishlist for ages and I'm pretty sure I have this one sitting in the huge pile of Color Clubs I received just before Christmas. I finally caved and got Atlantis after Kristy's post, but both of these are such a great colour I can see me wearing both. Plus my mum can share with me without me getting grumpy. Definitely way to go Blogger! this is one collection i have been thinking about getting and now it appears after your posts, that is going to be a given! Fashion Polish's swatches made me get these, although hers look really glossy. And I must find more time to read your blog! You have great swatches. Oh wow! 4 coats of top coat! I've had my eyes on these for a while and you are convincing me I need them. Where did you get yours from? I got mine set off ebay, but that seller no longer sells the collection. It was a bargain too only $21. I think I just timed it perfectly. I like it a lot:) looks very nice this nail polish:D:) love the color! Thank you. It is a really color! This color club nail polih have a amazing effect, the combination between glitter and a litle holo affect make me want it so much! Yes I love that this has a tinted base together with the glitter. I also got your email Tuli THANKS! Yep, if you have Atlantis you really don't need this. But as it was cheaper to get the whole collection for me, I'm happy to have got a back up. 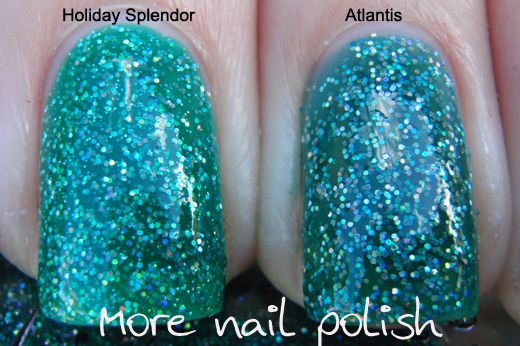 Ohh Holiday Splendor, I must have you. I'm splurging and buying you tomorrow! Do it Aly. I only had two Color Club polishes until I got this collection. It changed last week but if you answer someone that person gets no notice that you answered, which is a shame imo! I think you might be able to be notified when someone replies, as I see a Subscribe by email link below. Not that I've tried it to see how it works, but it might mean you can be alerted when someone replies. That's a really pretty shade! It sure is, thanks Annie. gorgeous! I'm on the hunt for that color..
as for the replies, I only noticed today as well!